What is the KAMRA Inlay? If you’re over 40 and reaching for reading glasses, we’ve got an exciting option for you! Does your loss of near vision interfere with your everyday activities like shopping, sending text messages, seeing your watch, reading a menu? Do you dislike reading glasses and can never find them around your house? Reading glasses can make us feel like our parents, some of us feel we look “old” in reading glasses, they are inconvenient, embarrassing, and make us wish our vision was like we were in our 20′s. Today’s 40-60 year olds maintains a very active lifestyle involving career, travel and outdoor activities. Most “feel much younger” than their actual age. KAMRA inlay is a procedure that Restores Visual Freedom reduces the need for reading glasses, delays the first sign of aging, revives near and computer vision, retains good distance vision, visual gains maintained over time. The KAMRA inlay is a mini-ring with an opening in the center. It is much smaller than a contact lens and lighter than a grain of salt (PICTURE). The opening in the center of the inlay restores near and intermediate vision by focusing light coming into the eye. 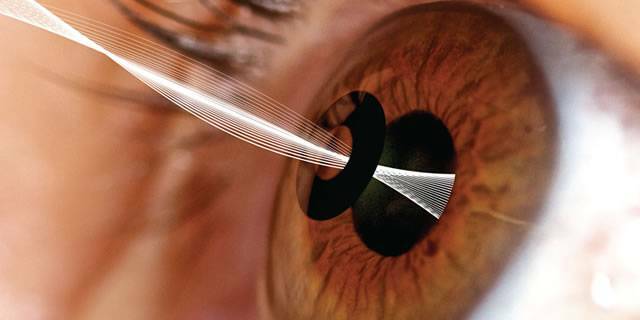 It is gently implanted within the eye’s outer layer (the cornea), during a procedure that takes less than 20 minutes. You won’t have any stitches or bandages, only eye drops and follow-up appointments to ensure proper healing. Our doctors would be happy to assess you for your KAMRA inlay candidacy and refer you for appropriate testing for it. We will help you see if its good for your vision.